Over the years we’ve seen a number of homebrew 6502 computers assembled with little more than a breadboard, a sack full of jumper wires, and an otherworldly patience that would make a Buddhist Monk jealous. Anyone who takes the time to assemble a fully functional computer on a half-dozen breadboards lined up on their workbench will always be a superstar in our book. While we’re still too lazy to attempt one of these builds ourselves, we have to admit that the Vectron 64 by [Nick Bild] looks dangerously close to something you might be able to pull off within a reasonable amount of time. It’s still an incredible amount of work, but compared to some of the other projects we’ve seen, this one manages to keep the part count relatively low thanks to the use of a simple 16×2 LCD for output and user input provided by a PS/2 keyboard. You won’t be playing Prince of Persia on it, but at least you might be able to finish it in a weekend. along with 32KB EEPROM. That should be enough for anyone. [Nick] also points out he tried to use era-appropriate 7400 series ICs wherever possible, so no worries about historical revisionism here. If you’re looking for a design that somebody could have potentially knocked together back in the 1970s, this one would get you fairly close. The astute reader might notice there’s no removable media in this build, and may be wondering how one loads programs. For that, [Nick] allowed himself a bit of modern convenience and came up with a scheme that allows an Arduino (or similar microcontroller) to connect up to the computer’s 28C256-15 EEPROM. With a Python script running on your “real” computer, you can write a new ROM image directly to the chip. He’s included the source code for a simple program which will write whatever you type on the keyboard out on the LCD, which should give you a good framework for writing additional software. If you’re looking for a bigger challenge, don’t worry. We’ve covered 6502 breadboard computers that will make your eyes water. Incidentally, this isn’t the first time we’ve seen a similar LCD used for one of these computers, so looks like there’s no shame in sneaking in modern parts where it makes sense. Someone walks into the Vintage Computer Festival and asks, ‘what’s new?’. It’s a hilarious joke, but there is some truth to it. At this year’s Vintage Computer Festival West, the exhibit hall wasn’t just filled to the brim with ancient computers from the Before Time. There was new hardware. There was hardware that would give your Apple IIgs even more memory. There was new hardware that perfectly emulated 40-year-old functionality. There’s always something new at the Vintage Computer Festival. Some of the more interesting projects are just coming off the assembly line. If you want a modern-day Lisp machine, that one won’t be assembled until next week, although there was a working prototype at VCF. If you want the greatest recreation of the most beautiful hardware, VCF has your back. Check out these amazing builds below. [Jack Eisenmann] is no stranger to building impressive DIY CPU’s on vast stretches of breadboard. This time [Jack] has done away with the seventeen breadboards he used in his last 8-bit computer and instead has gone a step further and designed a set of generously utilised PCB’s for the CPU. The result is the DUO Enterprise. The CPU design is based around an 8-bit data bus and a 24-bit address bus. As usual, a minimal yet carefully chosen instruction set allows [Jack] to do all the heavy lifting in software as part of the compiler and operating system he is working on. There is no sign of a display yet, instead the computer communicates via a dumb terminal. We love the aluminum foil for shielding! Check out the video, below, to see what we mean. Over the years, we have seen many of [Jack]’s other CPU builds featured on Hackaday. One of his first designs was a 4-bit CPU that could play many games on a LED matrix.Later he did a much more impressive 8-bit CPU along with analog video output and an OS ofcourse. It could even play pong. He even built a Single Instruction Set Computer (SISC). His final goal with DUO Enterprise is to allow anyone to utilise its computing power by submitting programs and calculations. Heads up [Jack], our neural net needs training soon. Every time we say “We’ve seen it all”, along comes a project that knocks us off. 60 year old [Mark Nesselhaus] likes to learn new things and he’s never worked with hardware at the gate level. So he’s building himself a 4-bit Computer, using only Diode-Transistor Logic. He’s assembling the whole thing on “card board” perf-board, with brass tacks for pads. Why — because he’s a thrifty guy who wants to use what he has lying around. Obviously, he’s got an endless supply of cardboard, tacks and Patience. The story sounds familiar. 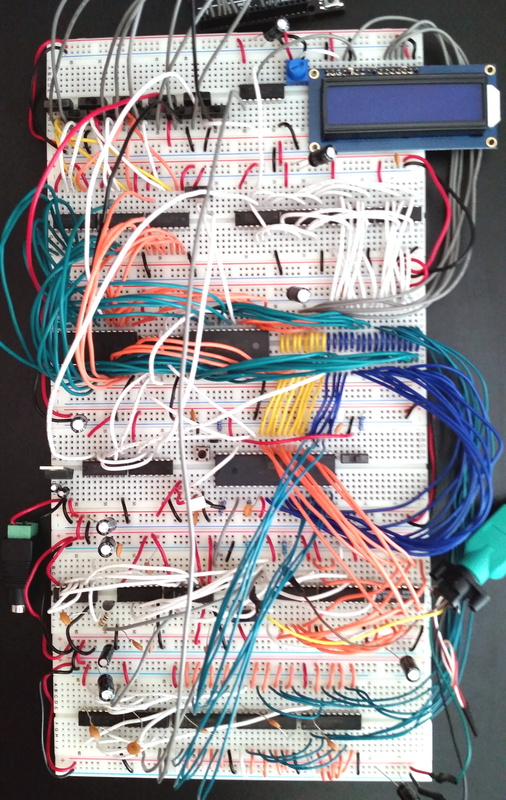 It started out as a simple 4-bit full adder project and then things got out of hand. You know he’s old school when he calls his multimeter an “analog VOM”! It’s still work in progress, but he’s made a lot of it in the past year. [Mark] started off by emulating the 4-bit full adder featured on Simon Inns’ Waiting for Friday blog. This is the ALU around which the rest of his project is built. With the ALU done, he decided to keep going and next built a 4-to-16 line decoder — check out the thumbnail image to see the rats nest of jumbled wires. Next on his list were several flip flops — R-S, J-K and D types, which would be useful as program counters. This is when he bumped into problems with signal levels, timing and triggering. He decided to allow himself the luxury of adding one IC to his build — a 555 based clock generator. But he still needed some pulse shaping circuitry to make it work consistently. [Mark] also built a finite-state-machine sequencer based on the work done by Rory Mangles TinyTim project. He finished building some multiplexers and demultiplexers, and it appears he may be using a whole bank of 14 wall switches for address, input and control functions. For the output display, he assembled a panel using LED’s recovered from a $1 Christmas light string. Something seems amiss with his LED driver, though — 2mA with LED on and >2.5mA with LED off. The LED appears to be connected across the collector and emitter of the PNP transistor. Chime in with your comments. This build seems to be shaping along the lines of the Megaprocessor that we’ve swooned over a couple of times in the past. Keep at it, [Mark]! Every few years, someone on the Internet builds a truly homebrew CPU. Not one built with a 6502, Z80, or a CPU from the 80s, either: one built completely out of 74-series logic chips or discrete transistor. We’re lucky enough to have [Alexander] document his build on Hackaday.io, and even luckier to have him enter it into this year’s Hackaday Prize. It’s an 8-bit computer built completely out of NAND gates. Computers are just logic, and with enough NAND gates, you can do anything. That’s exactly what [Alex] is doing with this computer. It’s built entirely out of 74F00 chips – a ‘fast’ version of the ubiquitous quad 2-input NAND chip. The architecture of this computer borrows from the best CPUs of the 70s and 80s. The ALU is only four bits, like the Z80, but also uses the 6502 technique where the borrow is an inverted carry. It’s a small instruction set, a 2-stage pipeline, and should be able to compute one million instructions per second. Designing a CPU is one thing, and thanks to Logisim, this is already done. Constructing a CPU is another matter entirely. For this, [Alex] is going for a module and backplane approach, where the ALU is constructed of a few identical modules tied together into a gigantic motherboard. [Alex] isn’t stopping at a CPU, either: he has a 16-byte ROM that’s programmed by plugging diodes into holes. It’s an amazingly ambitious project, and for entering this project into the 2016 Hackaday Prize, [Alex] already netted himself $1000 and a trip to the final round of competition. While not very popular, building a homebrew computer can be a fun and rewarding process. Most of the time, though, the video capabilities of these computers is as bare bones as it can get – running headless, connected to a terminal. While this is an accurate reproduction of the homebrew computers of the 1970s and 80s, there’s a lot to be said about a DIY computer with an HDMI-out port. [spencer] built a Z-80-based homebrew computer a few years ago, and while connecting it to a terminal was sufficient, it was a build that could use a little more pizzazz. How did he manage to stuff a terminal in a tiny project box? With everyone’s favorite five dollar computer, the Raspberry Pi Zero. The computer [spencer] built already had serial inputs, outputs, power, and ground rails – basically, a serial port. The Raspberry Pi also has TX and RX pins available on the 40-pin header, and with a stupidly simple board that [spencer] whipped up in KiCad, he could plug a Pi into the backplane of his homebrew computer. A few setup scripts, and a few seconds after turning this computer on [spencer] could mash a keyboard and wail away on some old school BASIC. This isn’t a use case that is the sole domain of the Pi Zero. A Parallax Propeller chip makes for a great video terminal with inputs for PS/2 keyboards and mice. A largish AVR, with the requisite NTSC video library, also makes for a great video interface for a homebrew computer. The Pi Zero is only five dollars, though. Although they weren’t very popular in America, the Amstrad CPC 464 and CPC 6128 were extremely well-received in Europe. [Zaxon] loved his ‘464, and for a bit of a learning experience – and the fact that an Amstrad takes up an exceptional amount of desk space – decided to make a clone of his favorite computer (.pl, Google translatrix). The clone began as a simple schematic of the original Amstrad CPC 464, but the parts used in the original required some modern equivalents. Still, most of the old chips remained in the clone; the original Hitachi HD46505 CRT controller remains, as do the original DRAM chips and the vintage Z80 CPU. A few modern amenities were added, including an interface for a PS/2 keyboard and a disk that’s much improved over the original cassette drive or weird 3.5″ disks: a Disk On Module, or basically a CompactFlash card in a strange form factor that plugs straight into a motherboard’s IDE socket. They’re mostly seen when tearing apart old thin clients, but using them in retrocomputing project is a great idea. Thanks [rasz_pl] for the tip. Video below.